Looks like the New York Times is getting a whiff of New Nordic with its article “New Nordic Cuisine Draws Disciples,”and taking a serious look at this new trend in the culinary world. The article comes just in time for the Copenhagen Cooking festival currently underway, and Claus Meyer’s MAD (“food”) FoodCamp this coming weekend. Even this in itself is showing how “new” Nordic is in essence “old school.” What’s new is the application of these old values: local, seasonal, pure and ethical cooking, as well as using some new methods (using molecular gastronomy + pure and raw materials, for example). You can’t tell me that Noma doesn’t use some pretty high-tech equipment alongside a pair of scissors for snipping up those cute little pea shoots! Following is an article I wrote on New Nordic that includes opinions about the movement given by some of the top chefs in Copenhagen. It’s fantastic that New Nordic is gaining momentum and that there are chefs in the U.S. “championing” Redzepi’s work, however it would be nice to see other chefs and restaurants jump on the bandwagon in the Nordics so it’s not just Noma that’s hurling it off the ground. Restaurant Herman’s modern version of an old Danish classic brændt kærlighed or “burning love,” (halibut, red beets, bacon, onions, and mashed potatoes). Herman’s forte is modernizing classic mor mor (grandmother) food. In his version, he makes the potato puree with a siphon to carbonize and make light and airy. 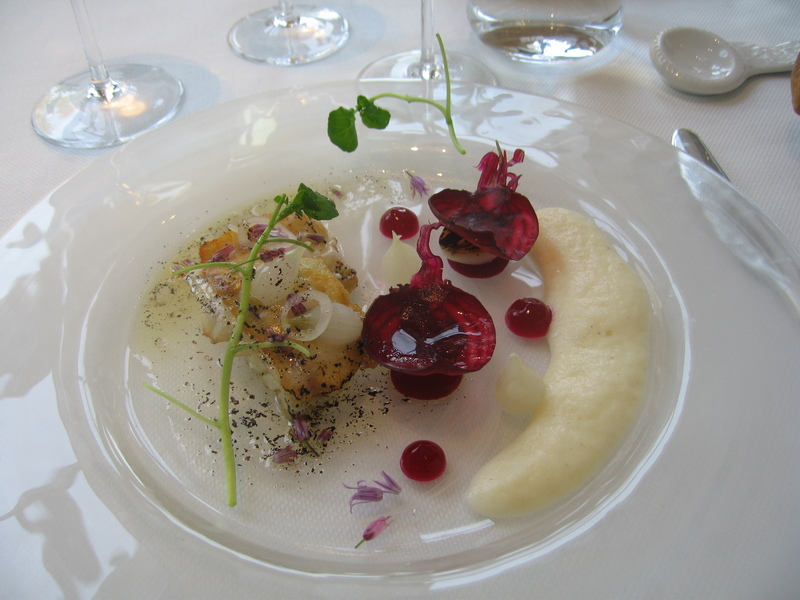 The fish is served with pearl onions, razor-thin sliced red beets, watercress and edible flowers dusted with the charcoal from the grilled pearl onions. A 10 point manifesto published in 2006 set the agenda for those willing to subscribe. Is there really such a thing as a “Nordic” kitchen? If so, what is it and what does the future hold? Perhaps this is what set the stage for New Nordic maverick Claus Meyer to lead the charge and become the driving force for the New Nordic Kitchen Manifesto. Not long after the manifesto was published the Nordic Council of Ministers adopted it and it became the foundation programs that have given wings to the initiative with its aim to, “inspire people and companies to develop Nordic food products and culture and increase their visibility.” Efforts span across the industry and it’s already shaping the way kitchens prepare and present dishes, how suppliers produce and market their goods, and how consumers view, purchase and consume them. The Nordic countries have long been associated with concepts like purity (think Norwegian fjords and Greenlandic glaciers), nature (Icelandic geothermal hot springs and volcanoes), and simplicity (Danish design). Age-old food preparations such as salting, curing, pickling and smoking have never really gone out of fashion, and are experiencing a sort of renaissance, like traditional fare from “mormors” (grandma’s) kitchen is. Other important pillars include the use of seasonal raw materials, and a focus on health and well-being, animal welfare, and sound production and cultivation practices. Nordic kitchen internationally. They are unique in the sense that they only use Nordic ingredients and don’t use olive oil, for example, because it’s not Nordic. What they do work with are items such as langoustines from the Faeroe Islands; halibut and cod from Iceland; and lamb, musk ox, and cloud berries from Greenland and other delicacies unique to the region. Apparently the answer is, yes. In my research as a writer for an upcoming guidebook on Scandinavia, I’ve had the opportunity to visit several restaurants and cafes in Copenhagen. To my surprise almost all of the places I visited have in some degree or another highlighted their use of local and seasonal Nordic ingredients. What seems to be the case is that many of the top gourmet restaurants in particular are adopting the New Nordic manifesto in their own way. Many choose the best ingredients (those with the most taste and gastronomic value), and continue to source from other origins while staying true to their own philosophies. Paul Cunningham from The Paul who focuses on more classic continental cuisine and Thomas Herman from Nimb Herman who reinvents traditional Danish dishes, both in Tivoli Gardens, and Jakob Mieklcke from Mielcke & Hurtigkarl, a new international contemporary restaurant, share this view. come. “In five to six years, you will see more restaurants around the world with a Nordic kitchen. Restaurants like Aquavit inNew York will become more common,” he said. While the leading restaurants have their own interpretations, a great majority is moving in a broader direction towards creating and defining New Nordic. Even though the lines are blurred between what one might consider an authentic Nordic kitchen and those that morph international influences with the best of what the Nordic region has to offer, there is clearly a movement taking place. According to Ferran Adría, “Nordic cuisine is expected to become the world’s next great cuisine.” Whether or not it will become a staple kitchen like the French, Italian or Spanish only time will tell. 1. To express the purity, freshness, simplicity and ethics that we would like to associate with our region. 2. To reflect the different seasons in the meals. 3. To base cooking on raw materials which characteristics are especially excellent in our climate, landscape and waters. 4. To combine the demand for good taste with modern knowledge about health and well-being. 5. To promote the Nordic products and the variety of Nordic producers – and to disseminate the knowledge of the cultures behind them. 6. To promote the welfare of the animals and a sound production in the sea and in the cultivated as well as wild landscapes. 7. To develop new possible applications of traditional Nordic food products. 8. To combine the best Nordic cooking procedures and culinary traditions with impulses from outside. 9. To combine local self-sufficiency with regional exchange of high-quality goods. 10. To cooperate with representatives of consumers, other cooking craftsmen, agriculture, fishing industry, food industry, retail and wholesale industry, researchers, teachers, politicians and authorities on this joint project to the benefit and advantage of all in the Nordic countries.